I know that when I choose a backlink checker I want the process of monitoring, finding, and reporting backlinks to be automated. I'm busy with writing, building businesses, and promotion. I'm sure you are too. I understand the importance of link building and I know that putting time into this SEO task can reap great rewards. There are plenty of tools on the market that can help with management of backlinks. Google search console is a great place to start but it has limitations. Third party backlink checkers step up where Google Search Console isn't able to deliver. Would you like to check your competitors' backlinks and see how well they are doing without forking out $100 a month? Linkody is a cloud-based SaaS product designed to help with finding and building links to your website. All-in-one SEO Tools can monitor backlinks to your website and your competitors' websites and perform other tasks. But they are expensive and come with extra features that many people do not need. Online businesses, bloggers, and startups want to maintain the backlinks they have already built. This is where the monitoring tool comes in. If a link goes down Linkody will notify you. The reasons for links suddenly appearing as ‘not found' could be due to problems with the server or removal by the site owner. In both cases, the cause should be investigated and the sooner the better. Linkody is simple to use. It doesn’t offer SEO research tools, keyword tools, or pay per click monitoring. But if you need to know when new backlinks to your site are created, or when current ones drop, Linkody is a great tool for the job. 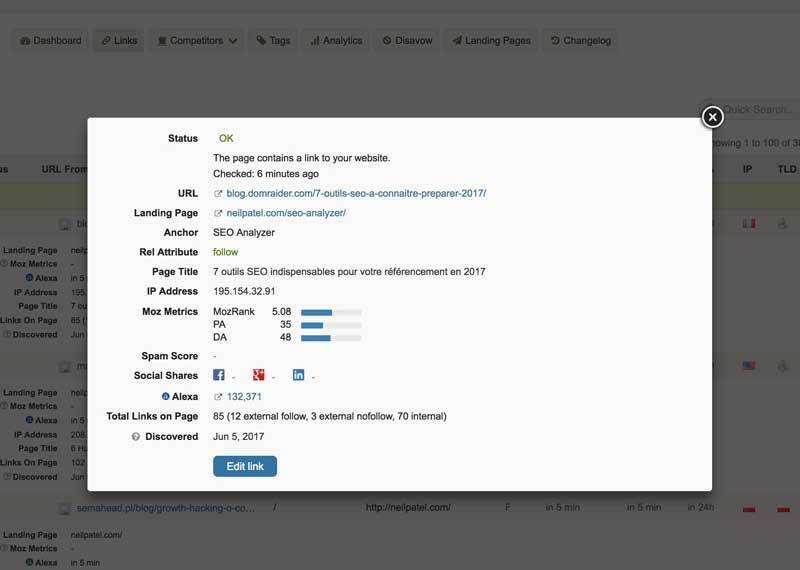 If you run an agency and like to give regular reports on link-building to your clients, the white-label reporting ability is a great extra feature that makes Linkody a solid investment. Interested in trying out Linkody? 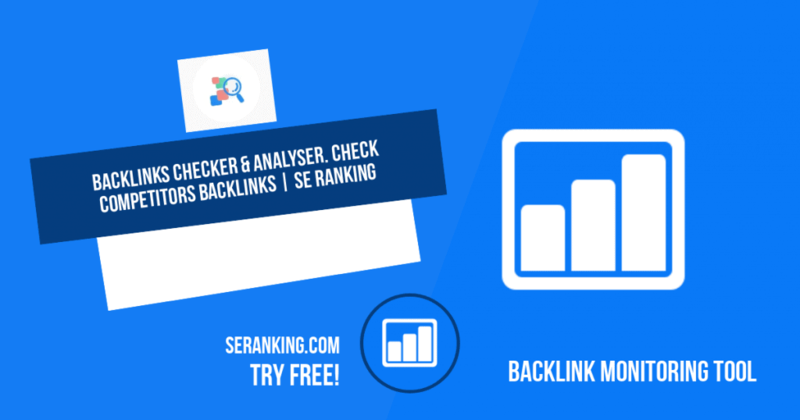 Give their free backlink checker a try before diving in. If you don’t monitor backlinks you have no way of knowing when links are lost or when spammy links are gained. 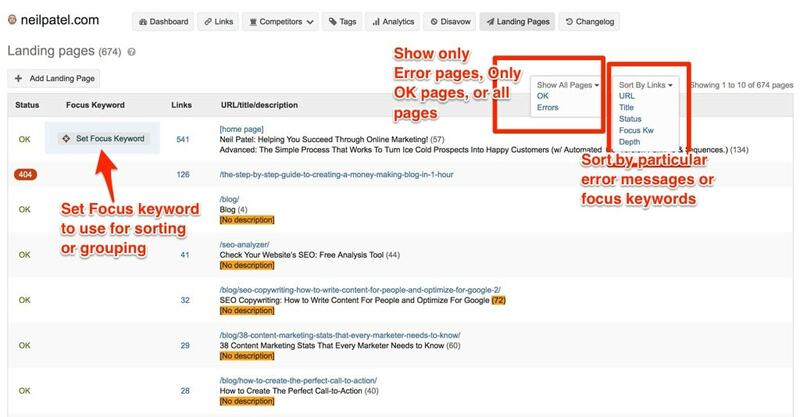 Monitoring your competitors' links also gives you an advantage. Your competitors backlink profile can help with your outreach tactics and gives you a good idea of where quality links are coming from. This is the topic of a completely different blog post. Backlink building is a complex topic and doing the work takes time and patience. But one of the easiest ways to build links to your website is to write guest posts on websites in your niche. You could write for any niche but it's much better to have a backlink from a relevant website. One of the most useful features of Linkody is the daily notifications that you can set up to monitor your backlinks. Getting an alert about a lost backlink, within 24 hours, allows you to contact website owners immediately. If the changes have been made manually on the linking website then the details are still fresh in the owner's mind. You can then try to discuss getting the link back before a lot of time has passed. By default, Linkody shows all backlinks from a single domain as one referral. For example, If a website links to an URL on your domain from the footer of their website, you will no doubt have many backlinks from this site. However, Linkody will list just one link. Otherwise, every single page on the site that contains the footer will register as a backlink. Google will not give a whole lot of value to footer or site-wide links so Linkody ignores all links but one, for the sake of clarity. Checking how your competitors are doing might seem like a distraction but it’s a very useful exercise in your link building strategy. If you understand where your competitors’ links are coming from you can attempt to build similar links or suggest a resource on your site as a replacement for a competitor link. The second option is much trickier to do than the first but it’s always worth a try. If you are familiar with SEO and Google’s best practises (link) then you might ask why the Disavow tool is still necessary? After the last penguin update, Google stated that they will devalue spammy links. So, no need to do it manually, right? Not quite. Google’s devaluing of irrelevant and spam links is based on an algorithm. Algorithms are not perfect. 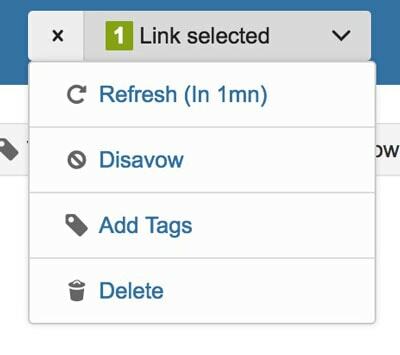 If you find some backlinks that you don’t want then it’s a wise move to disavow them. Google hasn’t changed the recommendations for using the disavow tool and the fact that you are proactively trying to keep your link profile spam free is a good sign. Want to know the ‘SEO value’ of your website’s backlinks? Linkody pulls industry standard rank metrics from two of the big players in the search marketing world, Moz and Majestic. Alexa is also included. Moz is a search marketing business that created a metric called Mozrank, which ranks websites based on the popularity of their backlinks and internal links. Moz’s Domain Authority is a measure of how well a site will rank on search engines. Basically, the higher the domain authority, the easier it is to get keywords ranked high on Google. Majestic’s trust flow and citation flow are measures of the quality of a website’s backlink profile. Trust Flow refers to the quality of links and citation flow refers to the number of links. Lots of backlinks with low quality is a sign of a spammy site so to get a good ratio of TF/CF you should focus on quality backlinks. 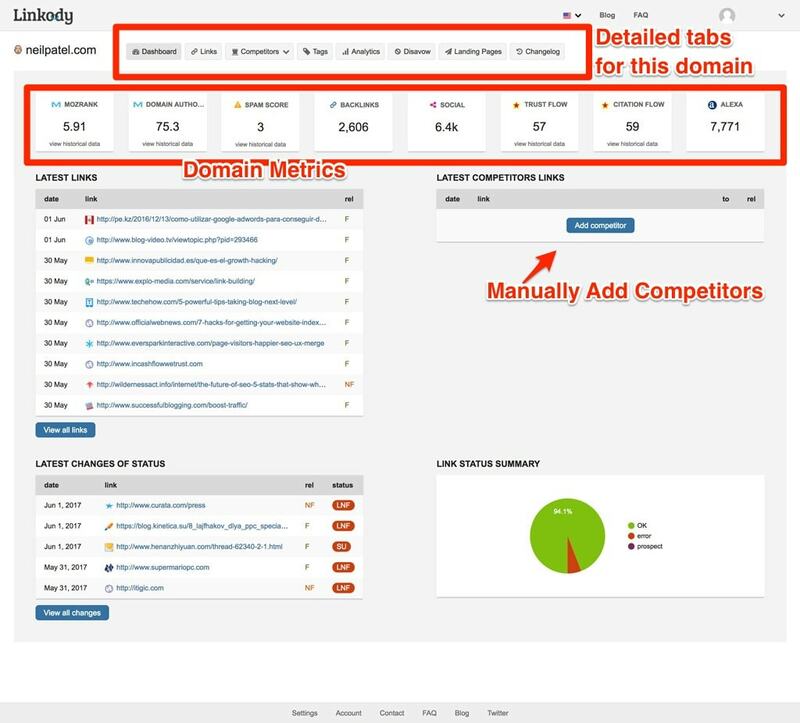 Linkody updates these metrics automatically for each domain in your dashboard. The social shares section shows the number of shares the homepage (root domain URL) has to Facebook, Google+ and Linkedin. The Alexa rank is an indication of a website's popularity. The lower the figure the better. Google has an Alexa rank of 1. Alibaba has a ranking of 185. The first thing you need to do is add your domain and let the software find your backlinks. 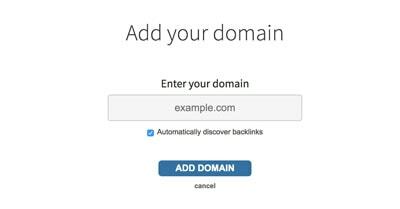 On the Domains page you click the button marked +Add Domain and enter the correct URL for your website (or any website that you'd like to monitor). Linkody will begin searching for backlinks so it's best to return later to view progress. Everything you need to know about your domain at a glance is available on the domain dashboard page. 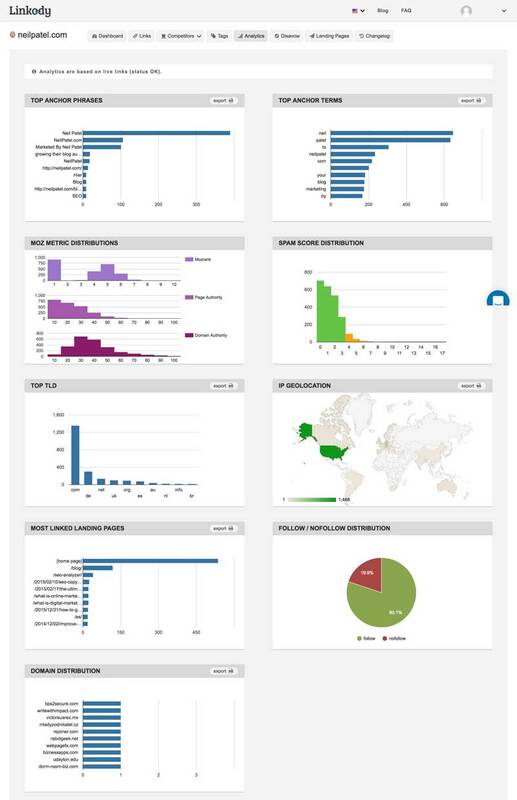 This is the starting point before moving on to more detailed link management, such as analytics and competitor links. The latest link section lists the latest backlinks that the software has found. The date of discovery and linking URL appear in the list followed by the type of link. This is either Follow or nofollow, indicated by F and NF respectively. In most cases, Follow links are the desired The reasons to prefer nofollow links is in the case of site-wide footer links (as I mentioned earlier). Making footer links nofollow prevents Google from suspecting that the many links coming from a single site are spammy in nature. The Dashboard page also contains a list of recently changed links. This is important because it gives you a quick overview of the most important information, newly gained and lost links. Handy for when you're doing lots of outreach and looking for guest posts. It's important to study the information presented here and discover why your (or a competitor’s) site has lost links. This information is helpful but for a more comprehensive understanding of the link's status click on ‘View All Changes’ and see a complete list. On this page, Linkody presents ‘Old Status’ and ‘New Status’ columns. If a link status has changed from OK to 404 not found it’s most likely because the referring page no longer exists. ‘Link not found’ indicates that the site owner has removed a link to your website. I really think Linkody should make this “hidden feature” a bit less obscure. The interface is very neat, but sometimes I forget that there ar some powerful tools available on the dashboard if you know where to look. Hover your mouse over any link on the Links page and a spyglass will appear before the URL From column. Yep, you probably didn't see that but this little gem will help you understand the quality of the link. Focusing on quality links is going to help your site so much more than low-quality links, no matter how many you have. Click the spyglass and an overlay window will appear detailing handy metrics and statistics about the linking domain and URL. The Moz Metrics, Alexa, and Spam Scores give a great indication of the value of the link. 502 – Bad Gateway. This is basically an invalid response from a server. Not something a webmaster ever wants to see. WR – Wrong Rel – Showing a No Follow link when a follow link is expected. The Competitors page is a manually created set of competitor domain links. If you want to keep an eye on your competitors and see when and where they get their backlinks, add their domain in this section. The process is the same as for adding your own domains. You can sort your competitors' domains by Date Added, Social Shares, Moz Rank, Moz PA, Moz DA, and Spam Score. The best part about this is the fact that Linkody will alert you when a competitor gets a new backlink. It's great to be able to see where another website in your space is buildong links. Armed with this information you can then attempt to build similar links. With all of the backlinks discovered (and added manually), you have the option to add tags. These are very useful for categorising and sorting backlinks. Adding tags is done on the links page. Tick the boxes in each row for the domain's you want to tag. A new pull-down menu will appear at the top of the Linkody page. Click the pull-down menu to reveal four options. Select Add Tags and add a descriptive tag in the text box. Returning to the Tags page you can then see the newly created tags and the link count beside them. By clicking on the cogwheel beside each tag you can edit the title, delete, and view links associated with the tag. You can also view links not associated with the tag. Click Export to create a formatted text file that you can upload in Google Search Console. This is the place to view the actual URLs on your site that your backlinks point to. They are the pages that users land on when they click through from a linking page. In most cases, the homepage will be the most linked URL. But if you've written a viral post or a particular part of your site stands out, the homepage might not get all the attention. Hovering over a row brings up the “Set Focus Keyword” box under in the Focus Keyword column. Use this to organize your backlinks and see which topics of importance are getting the most links. Add the target keywords for your landing page in this section. The sorting filters give you the option of viewing all pages, only pages with no issues, and pages with errors. The error pages are the ones that you want to focus on. Figure out what's happening and try to correct them before any damage is done. You can also sort by URL, Title, and Depth. Depth refers to the number of slashes in the URL. Fatfrogmedia.com/ppc/ is one level deeper than fatfrogmedia.com, for example. You can also set filters here to show landing pages with errors. The changelog page is a chronological record of all the changes to links monitored in your Linkody account. What should I do when Linkody alerts me to a lost backlink? Contact the owner of the website and try to discover the reason for the lost link. Sometimes the website owner does not know that a link is broken or has been removed. It’s always possible that a competitor has muscled in on your territory and asked for a backlink in place of yours. As websites sometimes have connectivity issues and updates, some URLs could be reported as ‘not found' or report 404 errors. Don't panic if you see these errors. Check the URLs manually and if they resolve you have nothing to worry about. If it looks like a link to your website has been removed by the webmaster you can ask them directly the reason for this. Sometimes it's an error. Other times the site owner might want to remove the number of outgoing links from their website. Communicating with the site owner is a good way of learning why you have lost backlinks. What if Linkody Can't find URLs that I know Link to my Website? You can import URLs into Linkody by clicking on +Add Links which opens a new window with three tabs: Single Link, Multiple Links, CSV Import Add a single URL by staying on the Single Link tab and typing the full URL in the first dialog box. Then click Add Link. It's as simple as that but you can add more information if required. Adding tags for management, the expected landing page, and expected anchor text all help Linkody manage the URLs. A handy feature is the ability to inform Linkody of an upcoming backlink. Select the “I am expecting a link from this page (prospect link)” radio button and choose a status. The status options of pending, requested, candidate and declined also help manage your outreach and backlink building efforts. 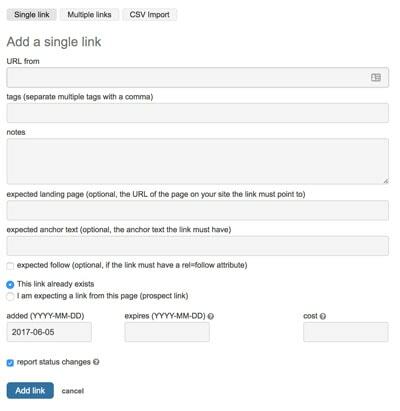 Add more than one URL by going to the Multiple Links tab and pasting a list of URLs. Make sure they are all on separate lines. Import URLs. The CSV Import tab has an upload feature where you can import and comma-delimited csv file containing as many links as you like. You can add URLs with no extra data or include tags notes, and everything else available. A sample csv file is available for download so you can check out the format. Using the Add Links feature is a very powerful way of predicting, managing, and prospecting for backlinks. How much does Linkody cost? The software currently has 5 pricing levels. The basic level, which is suitable for busineses with one website costs $9.90 per month. This allows you to monitor two domains and 500 links. With this plan, you would typically monitor your own domain and the domain of your biggest competitor (or another site that you want to spy on). The mid-tier plan is the Pro plan. This is suitable for websites with multiple domains, SEO professionals, or small agencies. This plan offers the ability to monitor up to 20 domains with 5000 links. The highest level is the Agency XL plan. This gives you the ability to monitor 100 domains and 50,000 links. 5 different users can also log in so it’s great for teams. You can try out the software for free for 30 days and then decide if you’d like to continue. And they’ve made it easy to sign up – you don’t need to enter your credit card. 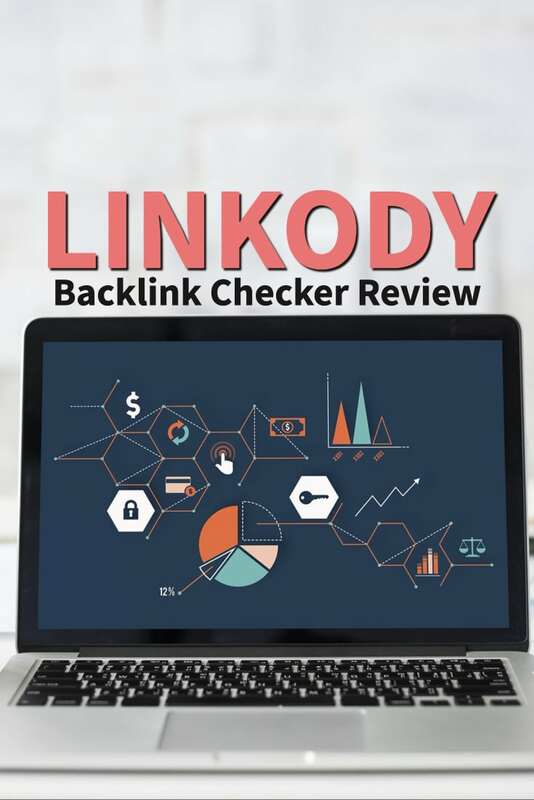 If you’re looking for an easy to use, inexpensive backlinks checker and monitoring tool, Linkody is a worthy contender. It's not the most powerful tool out there but it is certainly capable of presenting the most useful information in an understandable form. Note that reports are generated once per day so you won’t receive an immediate alert. You will get an email once the system has performed its 24-hour cycle of reporting. If you're an agency, the white-label PDF reports of backlinks are a neat feature. You can choose the fields to add to the report so as not to overwhelm non-techies or give the full details to more technical clients.